Post written by Lauren Guggenheim and Catherine Allen-West. In November, a federal court ruled that the Wisconsin Legislature’s 2011 redrawing of State Assembly districts unfairly favored Republicans deeming it an unconstitutional partisan gerrymander. This ruling is the first successful constitutional challenge to partisan gerrymandering since 1986. The case will now head to the U.S. Supreme Court—which has yet to come up with a legal standard for distinguishing between acceptable redistricting efforts and unconstitutional gerrymandering. While there have been successful challenges to gerrymandering based on racial grounds, most recently last week in North Carolina, proving partisan gerrymandering—where the plaintiffs must show that district lines were drawn with the intent to favor one political party over another—is more difficult. One reason is that research shows that even non-partisan commissions can produce unintentional gerrymandered redistricting plans solely on the basis of the geography of a party’s supporters. Also complicating matters are legislatures’ lawful efforts to keep communities of interest together and facilitate the representation of minorities. Because traditional efforts can produce results that appear biased, showing partisan asymmetries—the main form of evidence in previous trials—is not sufficient to challenge partisan gerrymandering in the courts. However, in recent years, scientists have devised several standards that could be used to effectively measure partisan gerrymandering. In last month’s Wisconsin ruling, the court applied one such mathematical standard called the “efficiency gap“- a method that looks at statewide election results and calculates “wasted votes.” Using this method, the court found that Republicans had manipulated districts by packing Democrats into small districts or spreading them out across many districts, which ultimately led to Republican victories across the states larger districts. Another method to determine partisan gerrymandering, developed by political scientists Jowei Chen and Jonathan Rodden, uses a straightforward redistricting algorithm to generate a benchmark against which to contrast a plan that has been called into constitutional question, thus laying bare any partisan advantage that cannot be attributed to legitimate legislative objectives. In a paper published last year in the Election Law Journal, Chen, a Faculty Associate at the University of Michigan’s Center for Political Studies and Rodden, Professor of Political Science at Stanford University, used the controversial 2012 Florida Congressional map to show how their approach can demonstrate and unconstitutional partisan gerrymander. First, the algorithm simulates hundreds of valid districting plans, applying criteria traditionally used in redistricting decisions—compactness, geographic contiguity, population equality, the preservation of political communities, and the protection of voting rights for minorities—while disregarding partisanship. Then, the existing plan can be compared to the partisan distribution of the simulated plans to see where in the distribution it falls. If the partisanship of the existing plan lies in the extreme tail (or outside of the distribution) that was created by the simulations, it suggests the plan is likely to have been created with partisan intent. In other words, the asymmetry is less likely to be due to natural geography or a state’s interest in protecting minorities or keeping cohesive jurisdictions together (which is accounted for by the simulations). In this way, their approach distinguishes between unintentional and intentional asymmetries in partisanship. 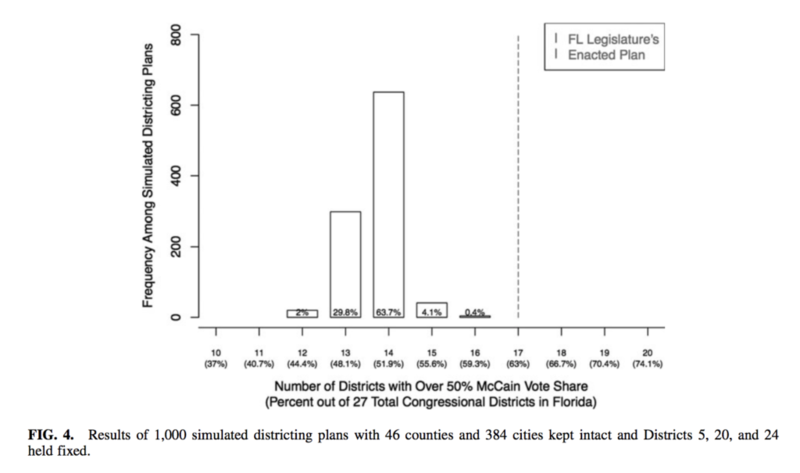 Using data from the Florida case, Chen and Rodden simulated the results of 24 districts in 1,000 simulated plans. They kept three African-American districts intact because of Voting Rights Act protections. They also kept 46 counties and 384 cities together, giving the benefit of the doubt to the legislature that compelling reasons exist to keep these entities within the same simulated district. The algorithm uses a nearest distance criterion to keep districts geographically contiguous and highly compact, and it iteratively reassigns precincts to different districts until equally populated districts are achieved. The figure below shows how this looks in one of the 1,000 valid plans. Next, to measure partisanship, Chen and Rodden needed both the most recent data possible and precinct-level election results, which they found in the 2008 presidential election results. For both the existing plan and the simulated plans, they aggregated from the precinct to the district and calculated the number of districts where McCain voters outnumbered Obama voters. The figure below shows the partisan distribution of all of the plans. A majority of the plans created 14 Republican seats, and less than half of one percent of the plans produced 16 Republican seats. However, none of the simulations produced the 17 seats that were in the Florida Legislature’s plan, showing that the pro-Republican bias in the Legislature’s plan is an extreme outlier relative to the simulations. Because the simulations they created were a conservative test of redistricting (e.g., giving the benefit of the doubt to the Legislature by protecting three African-American districts), Chen and Rodden also tried the simulations by progressively dropping some of the districts they had previously kept intact. Results suggested the Legislature’s plan was even more atypical, as they had less pro-Republican bias than the simulations with the protected districts. Chen and Rodden note that once a plaintiff can show that the partisanship of a redistricting plan is an extreme outlier, the burden of proof should shift to the state. Ultimately in Florida, eight districts were found invalid and, and in December 2015, new maps were approved by the court and put into use for the 2016 Election. This entry was posted in Current Events, Elections, Innovative Methodology and tagged elections, Florida redistricting, gerrymander, Jonathan Rodden, Jowei Chen, North Carolina, redistricting, Wisconsin on December 2, 2016 by Catherine Allen-West.